Citizen Poet is an ambitious project offering Salfordians the opportunity to capture a moment in their city’s history through poetry, prose and life writing. Taking inspiration from the role of the traditional poet laureate, Citizen Poet challenges this arguably elitist process of awarding an individual the status of creative representative by asking the citizens of Salford to document their own diverse experiences of life in the city. The project offers a unique opportunity for the people of Salford to develop skills, engage with an innovative creative process, celebrate their diverse heritage and experience great writing and storytelling. 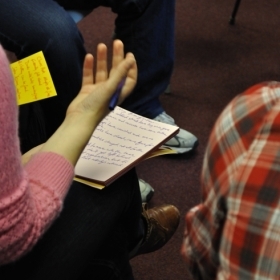 The project will also launch the WordPlay training programme for groups interested in becoming sustainable community creative writing groups, independent but affiliated and supported by the WordPlay hub organization. Through workshops and discrete projects WordPlay will seek to establish a core network of creative writing groups across the city in partnership with community and educational organizations. These groups will be created through one-off projects and will be facilitated initially by professional writers and community artists. 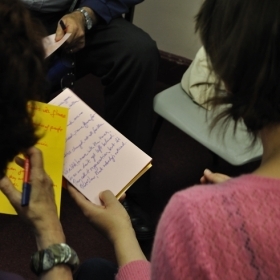 The network of groups will be supported to become self-sustaining through group leaders participating in a training programme based on the WordPlay community creative writing model. This model is based on nurturing a safe environment where new writers are supported to find their voice, develop technical skills and raise their creative aspirations. The WordPlay model places equal emphasis on process and product, seeking to raise the status of community writing to a respected and serious art from. WordPlay is a hub organisation offering these groups ongoing support through further training, resource development, profile raising and opportunities to collaborate on creative projects.